Pumpkin can be used for more than pumpkin pies. Pumpkin puree is wonderfully versatile and good for many a recipe, both sweet and savory. Here are low-fat ways to use your stores of canned pumpkin. 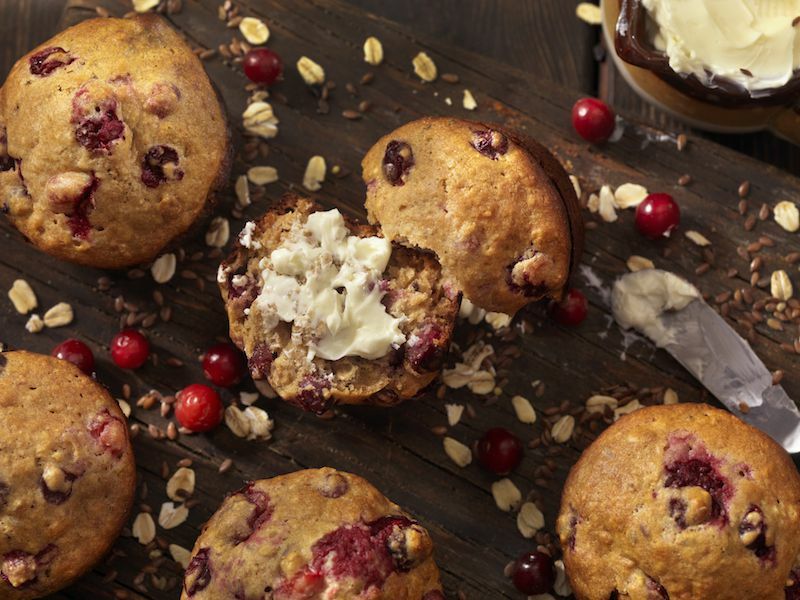 Not overly sweet, these delicious pumpkin cranberry muffins make a great snack or brunch offering. Enjoy the ginger, cinnamon, and nutmeg spices. They're best served warm, but they also freeze well. The muffins are made with nonfat milk, canola oil, ​and one egg. They contain about 8 grams of fat per muffin. Cranberries provide vitamin C while pumpkin is packed with vitamin A. You'll also get 1 gram of fiber per muffin. You can make oatmeal extra-special in fall and winter with this aromatic pumpkin oatmeal. Hot oatmeal is one of the few low-fat breakfast foods that can give you enough energy to make it through until lunch. Use a pumpkin spice mixture and cinnamon and include raisins for extra sweetness and texture. Oatmeal has beneficial fiber and the pumpkin adds vitamin A. One serving has only 1 gram of fat but packs 4 grams of protein and 3 grams of fiber. Add a seasonal twist to your usual quick bread by making a pumpkin bread. It's a great fall treat, that will fill your kitchen with a wonderful aroma. Slice it warm from the oven and serve with a mug of steaming apple cider. The oil in a typical quick bread recipe is replaced with pureed pumpkin and applesauce. This recipe further reduces fat by leaving out nuts. But if you aren't eliminating nuts, you can add some for extra texture. You can use canned pumpkin or leftover cooked and pureed pumpkin. There is less than half a gram of fat in a serving. Fall is the perfect time to make warming soups. This low-fat vegetarian pumpkin soup is perfect on a cold fall day, or as an appetizer for a Thanksgiving dinner. Best of all, it takes only 15 minutes to prepare. It has only 3 grams of fat per serving if made with soy milk, but you could also choose a non-fat milk. A spoonful of plain low-fat yogurt can be swirled in just before serving as well. Think of toasting some sage leaves or pumpkin seeds to add for a little crunch to turn this soup into something special. Make a creative entree for autumn. This risotto is vegan and low in fat at 4 grams per serving. If you use gluten-free vegetable broth it will also be suitable for those avoiding gluten. Most of the fat in a pumpkin pie resides in the crust. So if you're looking for a taste of pumpkin pie but with fewer calories and less fat, simply use fat-free evaporated milk and bake the pie recipe in a pie pan or dish sprayed with nonstick cooking spray. A recipe from Libby's has only 1.5 grams of fat with those substitutions. Of course, you could enjoy the pumpkin pie but leave the crust behind. That may not be well-received if it was baked by someone who has pride in his or her crust, however. Plus, you will want to eliminate whipped cream topping. Low Fat and Reduced Fat--Do They Mean the Same Thing? Does 'Fat-Free' Really Mean No Fat?